Today at group, my consultant was asking what made us decide we needed to change, and loose weight. For me it was this picture. This was mothers day, Emily is 5 months old here, so there is still some baby weight. However everytime I look at it, I'm so unhappy with how I look, it makes me sick to my stomach to see me that big. That was the day that I decided to change, that I would loose weight and be happier. I would love to know what made you decide to loose weight. So after the gain last week and feeling deflated, I'm happy to say I had a 2.5lb loss this week! If I'm honest I was stunned. I didn't think I would have lost anything this week. Although I have been eating better I'm still not eating nearly enough speed food, or drinking enough. Does anyone else kind of forget to drink water? I get so busy doing the housework, and playing with Emily it just slips my mind. I'm also not so great at keeping food diaries which needs to change. I have a bad week and then wonder where I went wrong. I think if I documented what I ate and when then I wouldn't have this problem. I brought a couple of recipe books this week at group, the 'fakeaway book' and 'family feasts on a budget'. I'm hoping that they give me some inspiration for future dinners. I love meal planning, but I am finding it hard to come up with meal ideas. Hopefully this can change that. The #swsunday linky is also proving very useful to find yummy new recipes. I have also come to the conclusion that I like excuses. Some of these may sound familiar, "I don't have enough time", "It's too hard", "I'll start next week", "I'm tired", "What if I fail?". The truth is, there isn't a excuse as to why I pick the sugary treats instead of a apple which will actually fill me up a little more. However I still do make excuses, 'It's my time of the month, I need chocolate'. Urgh even typing that infuriates me. I don't NEED chocolate. I WANT chocolate. The thing is, I don't actually enjoy it. I say to myself, 'oh i'll just have one square', which naturally turns into a whole bar. Once I'm finished I kick myself and feel guilty for eating it. I can get sympathy and understanding from people, which then helps me to jusify my 'excuse'. The only way it is going to improve is by stopping myself. I need to stop finding a excuse or a reason. I am great at finding excuses as to why I can't do something. The reality is, there is no excuse, if I want it enough I should just go for it. The non-existant 'excuses' stop me from hitting my target, they stop me pursuing my dream. I need to just think about what I am doing, and crack on. I guess it all comes down to attitude and effort, If I have a negative attitude towards weight loss, it is never going to happen. I won't do it, I will fail and I'll end up staying unhappy. When I had my first loss, I was so excited and motivated. I knew that this was what I wanted to do, but as the weeks pass I feel like I am loosing this motivation. One bad week leads to another, and another until I give up completely on weight loss. That is really not what I want. I decided that I needed something visual. So I have stuck a whole load of sheets on my wardrobe, that way I will see it everyday. It is full of squares, everytime I loose a lb I am going to cross it off. That way it is always there for me to see. There will be no more excuses, I will be able to see my target, and achieve it. Well In theory I will. What do you do to keep track of your weight loss and stay motivated? My week (weeks!!) has been awful :( like, really awful! Weigh in tomorrow.....urgh...I have no will power right now!! I am the queen of excuses, I have an excuse for absolutely everything! 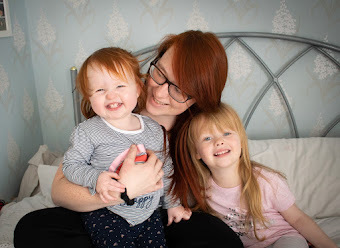 The first time I decided that I needed to shift weight was when we were getting ready for a party and everything was either too small or just looked awful on me, I then got pregnant so stopped. This time around it was when my comfy jeans were no longer comfy!